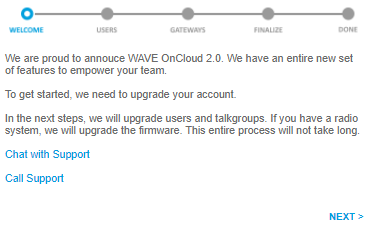 If you are still using WAVE OnCloud 1.0, then when you login to the WAVE OnCloud portal, a red banner will appear at the top of the portal page. Click the red banner to launch the Upgrade Wizard which will walk you through each required step to upgrade your account to WAVE OnCloud 2.0. The WELCOME page appears in the Upgrade Wizard. Optionally, click the Display Name to edit individual Users. Editing users may be performed now, or you can do it later after the upgrade. User editing is only for users who do not have contact information for receiving Activation Codes and/or connecting those Users to Radio Systems. Users without an email address or phone number will be created as WiFi-Only users and you or a Customer Employee will have to manually send them the activation code. (See Activating Tablet Users). Users with contact information will be sent instructions for obtaining activation codes. Users with existing phone numbers will not require any changes. The following procedure explains how to edit Users with a warning symbol (who are missing contact information). Users marked with a warning symbol are missing contact information. In the DISPLAY NAME column, click the User name to open the editing field. Add an email address or phone number and then click the SAVE button. After editing each user, the warning symbol will vanish. Once all users are updated, click NEXT> to proceed to the GATEWAYS page. On the GATEWAYS page, WAVE OnCloud lists all the WAVE OnCloud Gateways associated with your Customer account. 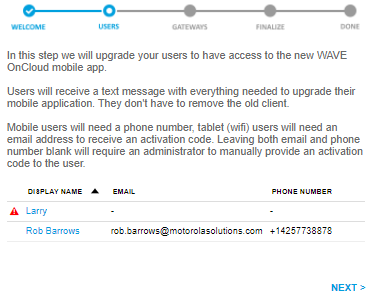 Ensure the WAVE OnCloud Gateways are listed correctly and then click NEXT>. Click the blue circular arrow button. The Confirmation dialog box launches. In the Confirm box, click the OK button. The Upgrade will take a moment to complete during which the spinner icon will appear on the page. After the upgrade completes, the DONE page appears. You may now return to using the Customer Portal via the commands in the left frame. If you encounter an error at any point in the process of upgrading, please contact wavesupport@motorolasolutions.com for assistance. 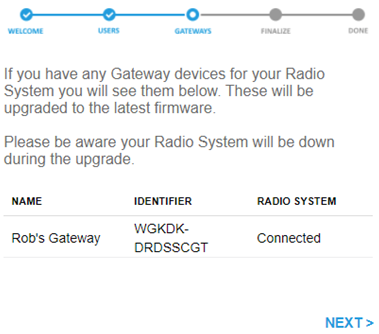 Errors can be due to a failure to connect with your WAVE OnCloud Gateway, incorrect configuration, bad network, or other issues.